We are excited to be partnering with our BFF, Cotton+Steel for a fun and informative Substrate Series. Devon, who you might recognize from our Sewalongs, will be teaching you all about how these fabrics are made and what’s so great about them over at the Cotton+Steel Blog. On the Colette side of things, we will be sharing our techniques for sewing these fabrics and which patterns work well with them and why. What’s a substrate you ask? A substrate is a material that underlies something else. In the fabric industry, it refers to the type of fabric in which a specific design is applied. This term is closely related to fiber, but even more specific and applies to weave, weight, and fabric construction as well. Today’s featured substrate is double gauze. Oh, double gauze! 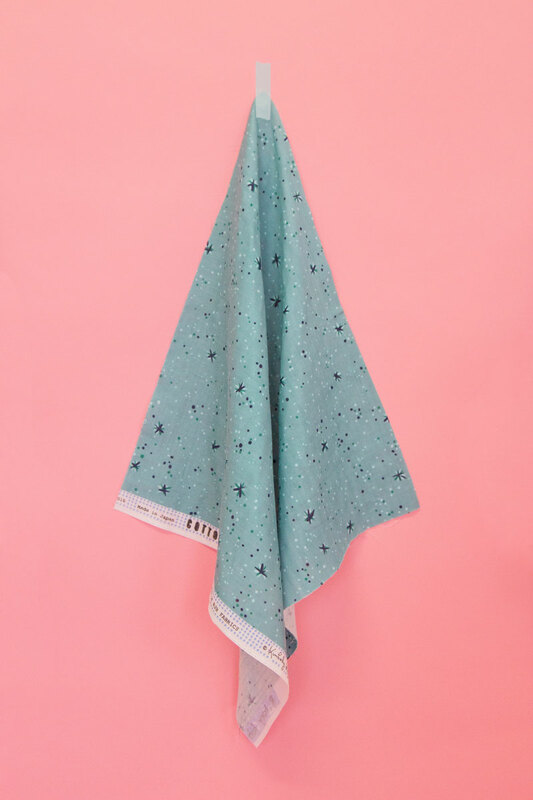 This snuggly, dreamy fabric is one of our favorites at Colette, and Cotton+Steel’s collection of designs are just too good to handle. Double gauze used to be hard to get your hands on, but these days this gorgeous substrate is in quilt and fabric shops all over! Double gauze is a soft, lightweight, and slightly airy fabric. It’s made from two thin and loosely woven layers of cotton that are basted together every ⅜” or so. These stitches form a subtle grid over the entire fabric that can hardly be seen from the right side. Because there are two layers woven together, the fabric has a nice weight and feels substantial. Double gauze makes beautiful blouses, dresses, skirts, and the coziest loungewear. 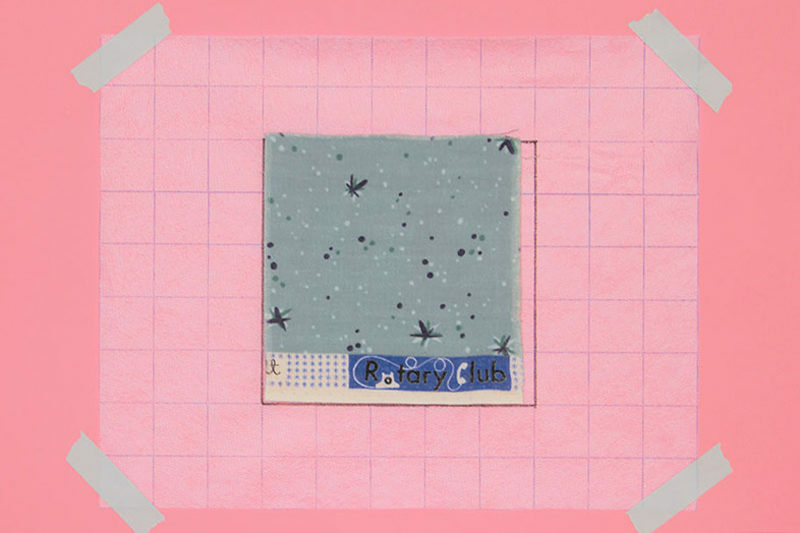 Taylor’s Crepe is sewn up in a double cotton gauze from the Rotary Club collection by Kimberly Kight, Space Thistles in Blue. It’s always a good idea to prewash your fabrics in the way you intend to wash them after your garment is constructed. Cotton+Steel recommends that double gauze be machine washed cold and dried cool or hung to dry. This is the amount of shrinkage that occurred on a 5″ square of double gauze after washing cold and drying cool. Gauze loves steam! Your iron’s heat should be at the cotton setting (medium) and there is no need to use a press cloth! Surprisingly, the two layers of basted together gauze don’t slip and slide too much when cutting. Like always, use a nice and sharp rotary blade. Mark your notches with a water soluble pen or chalk instead of clipping them. A clipped notch may get lost in the loose weave of the fabric. Basting stitches and tailor’s tacks are our favorite ways to mark double gauze. The supple weight of the double gauze holds the tacks in place and with thread marking there’s no fear of the marks not coming out. An iron-on lightweight interfacing that feels similar to the weight of the double gauze and matches the dominant color of your fabric. On the Crepe, we used a tricot fusible interfacing, that had a bit of stretch to it that allowed the fabric to still have movement. You may also use sew-in interfacing if that’s your thing, but keep in mind that you’ll be adding a third layer of fabric into the mix. Double gauze is on the heavier end of the lightweight fabric spectrum, a polyester or cotton 50wt thread, will work best. You should choose your needle size based on the type and weight of thread that is being used, as well as the fabric that is being sewn. A 70/10 or 90/11 needle will pair well with the 50wt thread and the fabric’s weave. Make sure to use a brand new needle, a dull needle will snag your fabric and cause runs. 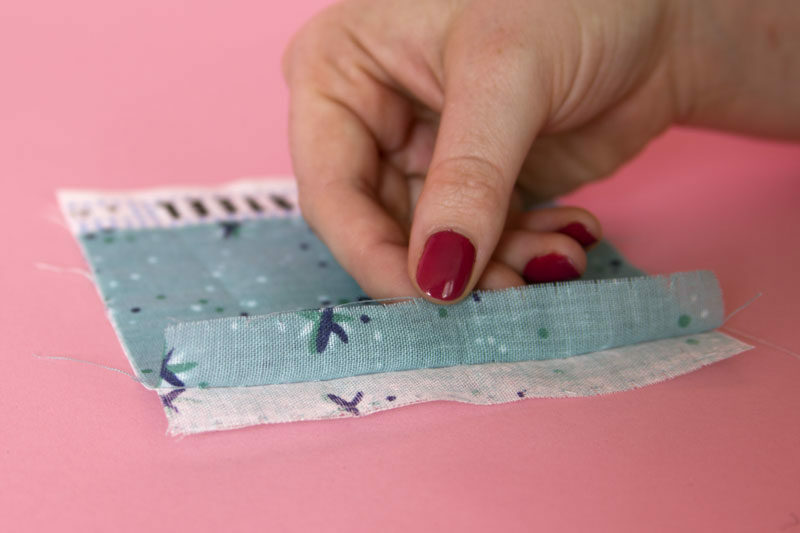 Double gauze has a tendency to unravel, finish seams with a serger or french seams when possible. Flat felled seams are a great solution if you are worried about the fabric warping. This seam will add some stability and structure while also hiding those pesky raw edges. If you are going to be finishing with a zig-zag, using a 3-step zig-zag instead of a 2-step will give you seam finish a bit more umph! A 1/2 “ then 1” hem will give the double gauze the room it needs and keep those edges from fraying. A rolled hem, by machine or serger are too fine for the loose weave of double gauze. When choosing patterns for double gauze, styles with some volume and a fair amount of ease work well. Structured patterns can work, but the inherent qualities of the double gauze will make them look more relaxed and casual. The Crepe dress is the perfect dress for double gauze. Double gauze is malleable and this dress is a curve-hugger with ample ease. The wrap of the dress takes advantage of the slight stretch of the fabric and the weight of the double gauze adds structure to the fullness of the skirt. 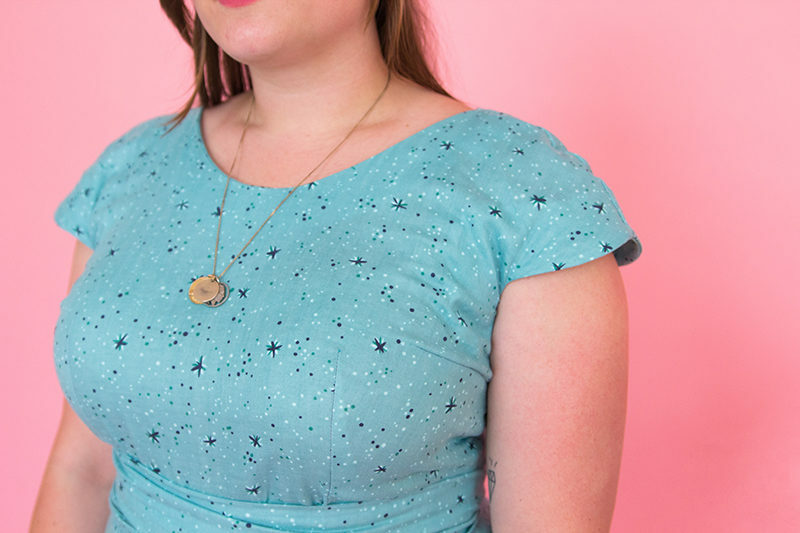 Instead of struggling to get perfectly crisp darts from this slightly shifty fabric, try choosing a garment that is shaped with gathers, like Dahlia. In this dress, the bust and skirt are shaped with soft and cooperative gathers rather than pesky seam lines. Also, the use of double gauze in an unlined garment will be silky smooth against the skin while being thick enough to hide unwanted lines. Hazel is an unlined dress with a gathered skirt and a flattering V-seamed bodice that lets you play with color blocking and border prints. Both of these dresses have a nice body grazing silhouette that is neither too tight or too structured. Fine glass head pins will be your best friend when sewing with double gauze. Because you are pinning through two layers of loosely woven fabric, there is more danger of snagging. The fine pins will wiggle their way easily through the layers. Glass head rather than plastic is always our preference. Plastic melts, glass doesn’t. Safe sewing is happy sewing! A walking foot will help you evenly feed the layers through your machine. I know we sometimes ignore it, I’m guilty too, but stay-stitching is a must when working with double gauze. Necklines, armscyes, and waistlines will stretch and you should staystitch these curves immediately after cutting them. Stay tuned as we dive into some more Cotton+Steel substrates in the next couple of weeks! Loving the substrate posts already! Since I have to mainly shop online for fabric this is just the kind of info I need to purchase without getting to feel the hand of the fabric. I really liked the suggested pattern types too. Already looking forward to the next substrate post. I love this fabric, and I love Taylor’s version! She looks so good in it, and so happy! However, it was frustrating to see in the closeup of the bodice that the darts aren’t fitting her correctly. The side dart has folded down, as though the dart would need to be bigger to fit properly, and the waist dart actually looks like it goes right past the bust apex! I know that the focus is on the fabric here, not the pattern, but it really doesn’t sell your patterns well when even you guys can’t get them to fit properly. Hi Kieran! Thanks so much for your kind words :). I really do love this dress and it’s super comfortable. And yes, the darts in the photo may not look like they are in the right place, but I personally liked the positioning and it made me feel great! If it makes you feel great and you’re happy with it, I guess that is what matters the most! Your fabric is very pretty and everyone is very excited to see you on your sewing journey! But I’m troubled by your comment. If you’d said, “I messed up on these darts, but I really love my dress and I’m going to wear it anyway,” everyone would have chimed in with their dart mishaps. But instead it sounds like you are not aware of how darts are actually supposed to fit, which is troubling because you work for a pattern company. Everyone was a beginner once, but- “the darts in the photo may not look like they are in the right place, but I personally liked the positioning and it made me feel great!”- I’m so happy they make you feel great, but they are not correct. If you were a home sewer who was showing your dress on your blog, no one would be entitled to comment, but you work at a pattern company. Don’t worry, fitting gets easier the more you do it! Good luck! This garment was sewn straight out of the envelope, not specifically for Taylor. The focus of this post was not to highlight fit, yet we acknowledge that the dart’s placement is not correct. Unfortunately, we just didn’t quite have the time to custom fit our samples for this partnership. Thank you for pointing out these fit issues and in the future we will try to take more care in fitting our samples. Why are your samples (at both the Colette and Seamwork sides of things) sewn and presented like they’re RTW? One of the major benefits of sewing your own clothes is fitting your own clothes to your individual body. Do you think maybe ColetteHQ should reevaluate schedules to allow for custom fitting the models? I mean, the Seamwork patterns only take 3 hours, right? How much of a slow-down would there be? (Yeah.) 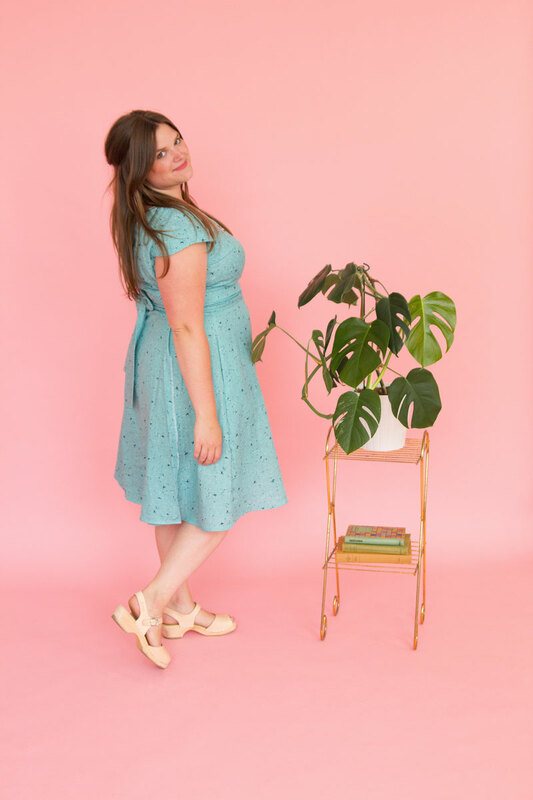 I really think Colette and Seamwork do sewing, sewists, and your own PATTERN company a disservice by continually putting out unpressed, unfitted, poorly-sewn garments (and unedited tutorials and articles) as representative of your products, your brand. I guess Colette is successful enough to ignore these types of comments (hey, what we’re doing is working so why change it?) but it honestly disappoints me to see quality control fluffed off like an inconvenience with regard to your public presentation. Especially when it’s relatively easy to get it right. We hear you, Debbie. Over the last few months, we’ve been overhauling our process, and we are still in the midst of it. I thank you for your feedback and ask for your patience as we grow. We’re still a small team, and we care very much about our products, so if you have additional thoughts, please send them to us directly. Honesty, I agree. That dart situation is a major problem. It’s not that they “look” like they’re not in the right place. They AREN’T in the right place. I’m kind of shocked that anyone at Colette let this go out like this. It’s a very pretty fabric, but it does the Colette half of this partnership a disservice to showcase such a poorly-fitted garment. It makes me wonder if the Crepe is drafted for women with breasts on their shoulders (except I know it is, because I own it, & I’ve made it, & the bust point is just too high, though it’s a problem that can be fixed & should have been fixed for this post). Thanks for your feedback, see my comment above to Betty. I guess I’m still not quite understanding what a substrate is. Is it just another word for fabric with a design printed on it? The definition of a substrate would lead me to believe it is a lining, but seeing as the dress is made from double gauze, that is obviously not the case. Fabric with a design printed on it is a perfect definition. Think of a fabric design you love… it may come in two substrates, quilting cotton and double gauze. :) Hope that helps! It might clarify things if you included the rest of the Google definition for substrate: a material “on which some process occurs”. In this case the process is ‘printing’ and substrate means the base fabric. 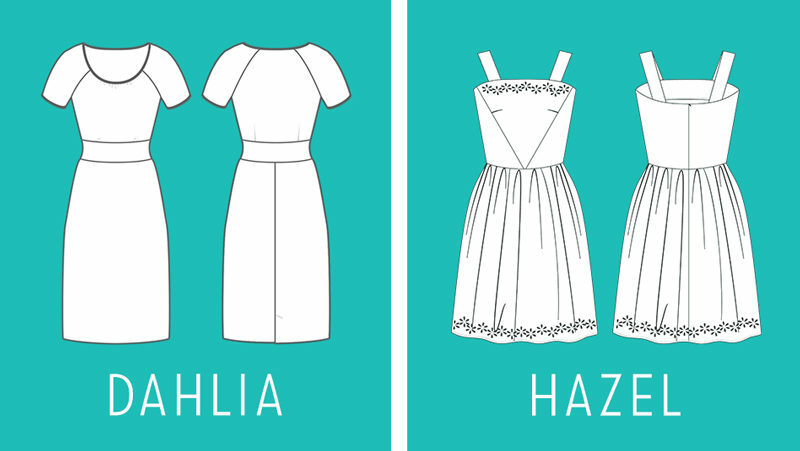 The term has been showing up in sewing circles lately because fabric manufacturers that used to only produce quilting cottons have branched out into fashion fabrics and are trying to distinguish the same pattern on different base materials (gauze, rayon, canvas, etc). “Fabric with stuff printed on it” is technically correct but not really useful here because the point is we’re discussing the differences in base materials that ALL eventually have stuff printed on them. Kind of random, but where are those shoes from? I’ve been looking for a pair like that forever and I can’t find them anywhere!! No worries, we get it all the time! They are from Lotta from Stockholm. I love Lotta, you should check them out! For a sheath dress, you should not need to add interfacing to any part of the garment. Refer to your pattern and see if and where they ask for interfacing and use iron-on lightweight interfacing if the pattern calls for it. Hi, Thank you for explaining this type of fabric and Taylor looks so lovely in her new dress. I bet my granddaughter would love this dress too! Thanks for this very helpful post, I have never worked with double gauze before but it sounds lovely! Maybe I’ll include it in my summer sewing list (I’m in the southern hemisphere). Taylor you look fantastic in that beautiful Crepe dress! I love this series! I’m curious about lining–if the double gauze is too sheer to be used alone would you line it? Or wear a slip? If you line it, what type of fabric would you use? Double it up & self-line? Or would you use cotton batiste or lawn?